It was super close the airport however the shuttle does not run before 5:00AM which would have been good to know before hand. The airport shuttle was the whole reason we chose the hotel. Hotel was nice, clean and comfortable. The staff was friendly. We had a nice visit. We had to leave earlier than the breakfast hours - so no comment there. Very nice hotel. I really enjoyed my stay. It was a welcomed change to prior BW experiences. Close to the airport but no plane noise. Staff was very nice quick checkin and friendly shuttle driver to the airport. Great room that’s really convenient to an early departure or late arrival in NOLA. Very nice facility, it appeasrs to be new. The bedding is good quality and the local shuttle was very convient. We are staying here for a night before we take a cruise out of the Port of New Orleans. It has been an excellant stay with shuttle amenities for the airport and the port. What a huge convenience! Friendly, knowledgeable staff, a clean comfortable room, and hot breakfast. All we needed and more. If we make it back to New Orleans in the future we will use this hotel! 1) When checking in, the clerk (female) was not friendly at all so we did not feel welcome. 2) When we entered the room, we noticed right away that there were no pillows on one side of the bed, they were all on the other side. 3) The bed pad was ripped and torn near the head of the bed. 4) There were only two sets of towels available which was really inconvenient. 5) We were there three nights and after the first night, I had to remove the sheets from the bed in order to have fresh sheets. 6) When checking out, the clerk (male) said that the receipt would be sent to my email, and i would have liked a paper copy also but it was not mentioned as an option. 7) Sorry, but we're not sure if we will have a return stay. Staff very friendly and helpful. Room was very clean and comfortable. Nice hotel close to the airport. Plenty of food places and casinos near. Twenty minutes from Bourbon Street. My only issues were the young lady who worked the front desk at check in could have been more approachable. Glad I bought my own towels because they're towels looked old and very dingy. Hotel needs to invest in new towels. 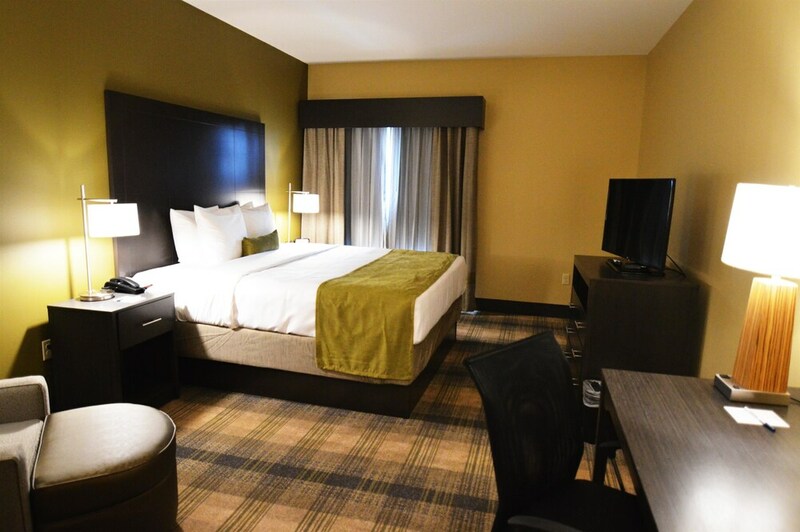 Located in Kenner - Louis Armstrong International Airport, Best Western Plus New Orleans Airport Hotel is within a few miles (5 km) of sights such as Imtt Field and Rivertown Museum & Kenner Planetarium. This 70-room hotel welcomes guests with conveniences like free breakfast, an outdoor pool, and free in-room WiFi. A 42-inch TV comes with cable channels, and guests can stay connected with free WiFi and wired Internet. Pillowtop beds sport premium bedding and the bathroom offers a hair dryer and designer toiletries. Other standard amenities include an MP3 dock, a refrigerator, and a microwave. Built in 2016, the brand new Best Western Plus New Orleans Airport Hotel offers an outdoor pool, a fitness center, and free WiFi in public areas. There's free parking, as well as a free airport shuttle (available on request). The front desk is staffed 24/7 to help with luggage storage, securing valuables, and dry cleaning/laundry. Additional amenities include a conference center, a 24-hour business center, and a computer station. Thank you so much for reviewing us. We are always happy to hear positive feedback and glad that we provided the service you expected. We hope you will stay with us again on your next visit and we can do even better. Have a great day! Recreation features at Best Western Plus New Orleans Airport Hotel include an outdoor pool and a fitness center. The preferred airport is New Orleans, LA (MSY-Louis Armstrong New Orleans Intl. ): 6-min drive, 1.7 mi/2.8 km. Airport transportation is available on request from 5 AM to 11 PM. Fees may apply. Guests must make arrangements in advance by contacting the property. This property's extended parking fee is USD 12 per day during the holidays from December 20, 2018 - January 2, 2019.